Art Pope, Chairman and CEO of Variety Wholesalers, speaks to company executives and county officials during the opening of a 1.4 million square foot distribution center in Coweta County, Georgia. 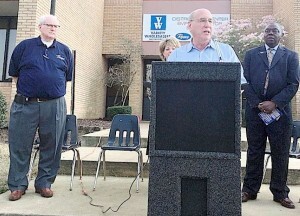 Photo credits to Walter Jones/The Newnan Times-Herald. nce again housing hundreds of jobs and acres of merchandise following Wednesday’s ribbon cutting for Variety Wholesalers Inc. The Herring Road facility built for Kmart has been vacant since that company moved out in January 2015. Last August, Variety announced it had signed a lease with the building’s new owners for 1.4 million of the 1.9 million square feet of space. The area Variety is using, equal to 29 football fields, has space for 80,000 pallets of goods that will be shipped to stock 180 stores of the Roses, Roses Express and Maxway brands. That includes a Roses Express store in Newnan’s Merchant’s Crossing, 50 Bullsboro Drive that recently opened. “We’re looking forward to a long, great partnership,” he told company executives and local civic leaders on hand for a ribbon-cutting ceremony choreographed by the Newnan-Coweta Chamber of Commerce. The Newnan building is the 102-year-old company’s only distribution center outside of its headquarters in Henderson, N.C.
“This, for us, was a major undertaking,” said Variety President Wilson Sawyer. Sawyer also gave credit to local and state officials for streamlining the processes for permits, hiring and training. With the help of two job fairs offered by the Georgia Department of Labor and training by the Georgia Technical College System’s QuickStart program, Variety has already hired 11 managers and 200 full-time employees, some who had worked at the same building for Kmart. And the company is still hiring, currently for truck drivers. It will eventually have 320 employees here. Shipments begin this week to the first handful of stores from merchandise that has been arriving for six weeks.